You'll need a flat surface to rest the cutters on while you cut the chases. Something about 1-1/4" wide and about 4" long. Thickness is a preference, but mine's about 3/8". 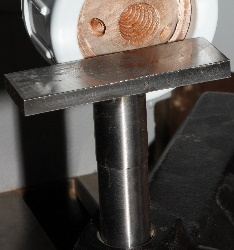 The height needs to be such that the top of the cutter, when rested on the tool rest, is dead-center to the sphere. It's possible to make a flat tool rest out of wood and perhaps a piece of 90' angle iron. I couldn't find one available anywhere, so I had one made. It works very well and we have them for sale in our store.